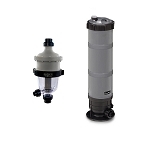 The Clean & Clear filter combines top-end filter performance with low maintenance. 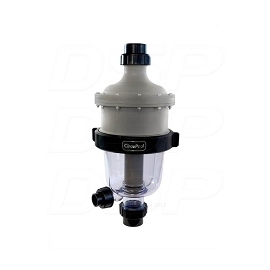 This dependable design uses special filter elements to strip tiny particles from your pool water particles as small as 20 microns. (An average grain of beach sand is 1,000 microns!) Plus, cleaning is a breeze. Open the top, remove the cartridge, hose it off and the Clean & Clear filter is ready to go again. 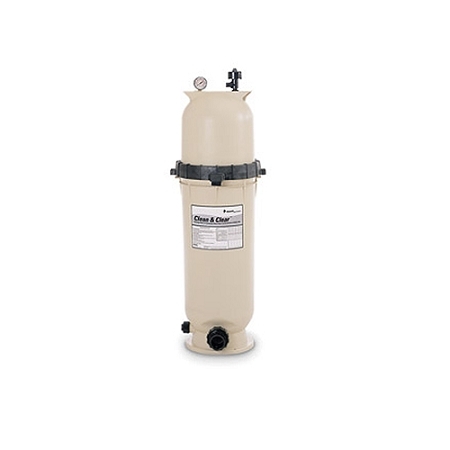 Q: is this filter ok for 13000 gallons ? 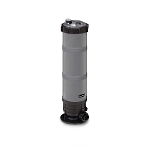 A: Yes, most 150 square foot filters are good for pools up to 18000-20000 gallons. Q: I just need a replacemnt filter C-9415, do you sell those separately? A: Unfortunately, we do not currently stock that item. Clamp ring allows easy access to cartridge and internal parts. Single-piece base and tank are constructed of fiberglassreinforced polypropylene for strength and chemical resistance. 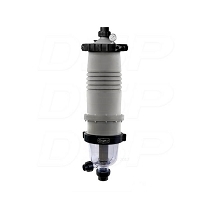 High-Flow™ Manual Air Relief Valve and continuous internal air relief work together to maintain optimum filtration efficiency at all times. 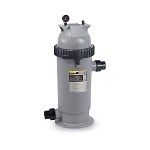 1½" drain and washout for quick and convenient maintenance and winterization. 2" plumbing for maximum flow. Dimensions: 42 x 14 x 14 in.